hello!so sorry about not posting.i am up to my elbows in projects. painting, painting, and more painting. but, i will share soon i promise! things are starting to come together on my office/studio, so i’m excited to get things in a nice working order so i can have some organization while i work. plus, my chairs finally came back in stock and they should be delievered soon! it will be nice to have chairs instead of a way too tall stool where i kill my back.anyhow, i thought i’d show you a darling bag i picked up at the bijou market from freshly picked. isn’t the bow awesome? 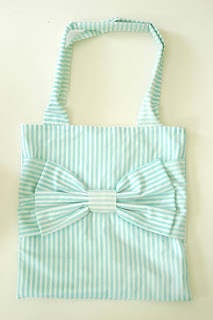 yes, i said awesome..susan just filled her shop with these darling striped bow bags, check them out here.i wouldn’t mind having these colors too! 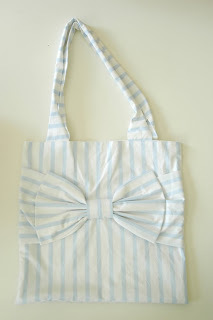 these bags are the cutest!